I'm just seeing the 1 from Andrew Slater? With the long gap in recruiting and still some lingering uncertainty regarding Wade (there still could be an NCAA investigation later on) this is one of those signings I'll believe when I see it. 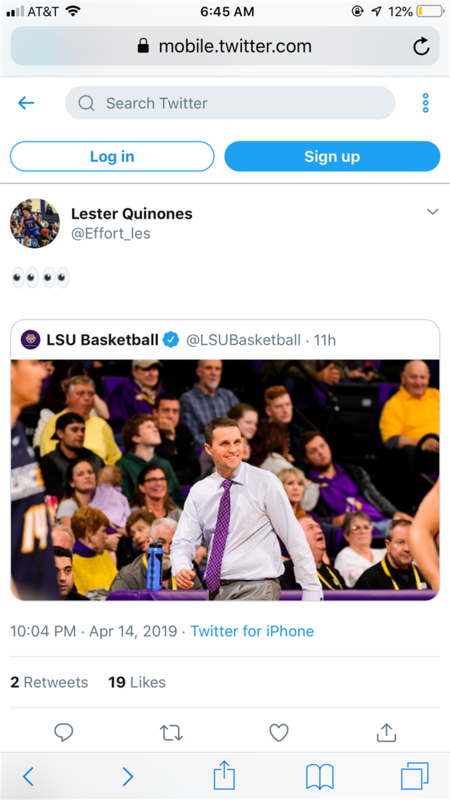 Still, there is a huge vacancy in LSU's frontcourt that he could immediately come in and fill. LSU desperately needs some size in this class and he would essentially be a starter from day 1 out of necessity if nothing else. What a turnaround it would be if we still nab Watford and Quinnones, along with convincing Smart, Mays and Williams to return. To be able to still pull in a great class after all the garbage that has ensued over the last month would make Wade legendary. I see no Universe where LSU loses Smart, Williams or Mays. He's not a small forward whatsoever. Taylor will still be starting at SF. Also highly unlikely Sy is coming here, Ole Miss is by far the leader on that front. Just getting ready to post the same thing. If Watford does come here, he's starting. Still I wouldnt count all of Sy/Watford/Quinones in this class. The admins did a lot of damage in regards to those latter two we're going to have to pull off the late miracle to land them if only even 1.